This Queen Anne style house was originally built at 1100 LaFarge by Frank and Rose Jordinelli circa 1904. The house, along with its summer kitchen, were moved to the Louisville Museum campus in 2001. 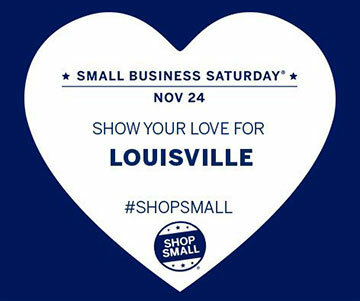 For more information about Louisville’s Historic Preservation Program contact Felicity Selvoski, 303-335-4594 or 303-335-4588, fselvoski@louisville.gov. 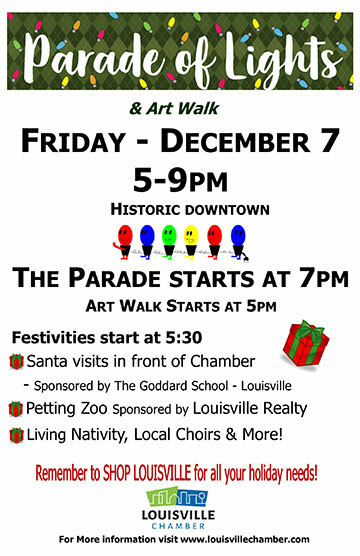 Once again we welcome one of our favorite Holiday pastimes to Historic Downtown. Along with the Carriage Rides we couldn’t get more charming could we? Boasting over 6,500 square feet of ice, WinterSkate is the largest outdoor ice skating rink in the county! Looking forward to freezing on the ice with the kiddos! Opening in November and daily through Presidents’ Day. Be sure and check out the latest in our gallery of murals on Via Artista. 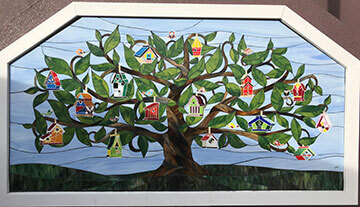 This beautiful 8’ x 4’ stained glass piece was created by artist Robbin Merta. AFTER YOU VOTE, treat yourself to this amazing journey of Chilean wines from the Maipo-Andes vineyard of Haras de Pirque Winery. Enjoy robust Chilean wines with cheese and charcuterie pairings. 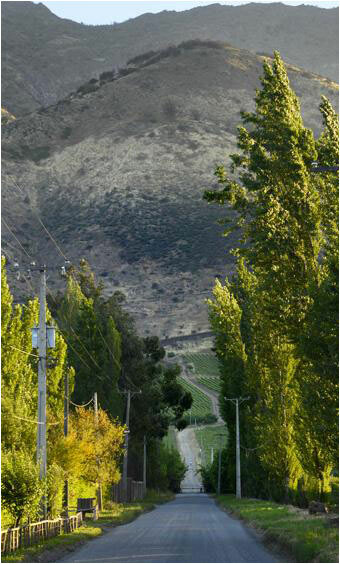 Their wines are the expression of unique terroir and blend iconic Chilean style with Tuscan tradition. Start the evening with a beautiful pisco cocktail followed by three delicious wines. Fine wine specialist Timothy Hartin with Breakthru Beverage Distributors will guide guests through the tasting. Tickets are $45 and will sell out fast. 1335 East South Boulder Rd. Residents of Louisville now have a new, convenient option to recycle their unwanted paint. Juniper Paints is now accepting unused and unwanted paint from the community. There is no charge to drop-off paint. The paint recycling program – which is available throughout Colorado – is made possible by PaintCare. The PaintCare program makes it easy and convenient for residents of Louisville and across Colorado to recycle their unwanted paint. Juniper Paints is open Monday through Friday from 7:00 am to 6:00 pm and Saturday from 8:00 am to 5:00 pm. They will accept all paint brands, regardless of where they were purchased. Items that can be dropped off for recycling include most house paints, primers, stains, sealers, and clear top coatings (varnish and shellac). For more information on the PaintCare program or to find a PaintCare drop-off site visit www.paintcare.org/colorado. 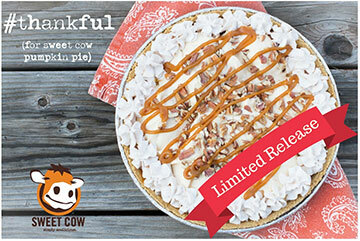 Here’s how Sweet Cow is making Thanksgiving a little more delicious. First, they take a graham cracker crust and fill it with fresh pumpkin pie ice cream. Then they drizzle Hammonds Caramel back and forth, and finish with homemade cinnamon whip cream around the edges, and candied pecans across the top. Order yours today and share a little slice of your favorite local ice cream shop. Get some of your holiday shopping done early and get your kitchens ready for Thanksgiving. The Annual Holiday Open House will feature cider, goodies, holiday cheer and 20% off your purchase (some exclusions). Also don’t miss knife sharpening on November 10 from 10:00 am – 2:00 pm. Mountain High Appliance is proud to welcome Chef Andrew Forlines as their new Executive Chef and Culinary Director. With eight years of experience training and working under world-class international chefs at the five-star, five-diamond Broadmoor Hotel, Chef Andrew is sure to bring the same elevated customer service to the kitchen that customers already enjoy in their other interactions with Mountain High Appliance. 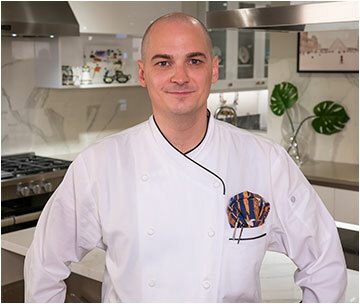 Chef Andrew is developing an exciting culinary program which includes cooking classes, food demonstrations for customers, exquisite showroom lunch and dinner events, and a chef’s perspective on appliances. The Gallery is pleased to present returning artist Ana Maria Botero and fine art photographer, Janet Koelling. New to the Gallery are Malia Quinn and Olga Karpeisky. 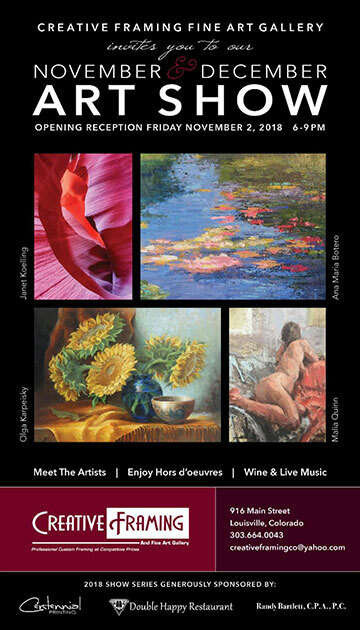 Come meet and greet the artists and bring friends and family. Live music will feature Miguel Espinosa, a critically acclaimed master of guitar, specializing in Flamenco and Jazz Fusion. Wednesday Addams, the ultimate princess of darkness, has grown up and fallen in love with a sweet, smart young man from a respectable family – a man her parents have never met. Everything will change for the whole family on the night they host a dinner for Wednesday’s “normal” boyfriend and his parents. 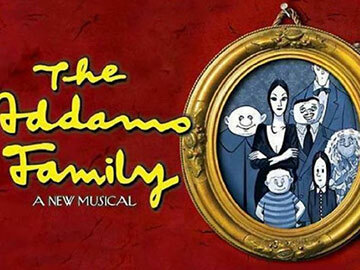 The Addams Family Young@Part® is the authorized 65-70 minute edition of the Broadway musical for youth theatres. 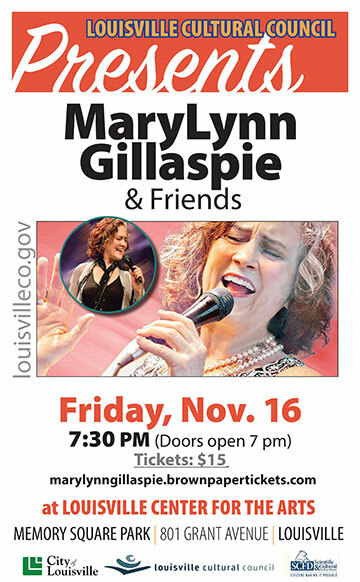 Don’t miss Louisville’s own Diva of Jazz as she belts it out with a backup band of great musicians. Tickets are $15 and seating is limited. Craft your own homemade holiday gifts! This open house-style Expo is a perfect opportunity to interact with hands-on projects and equipment. 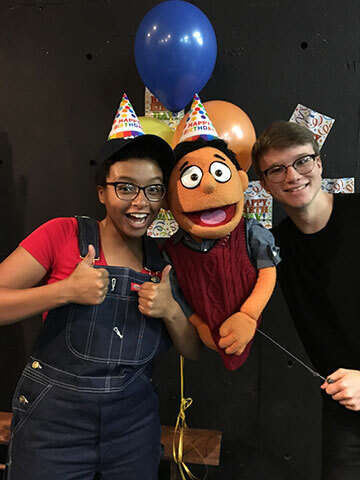 Free and family friendly! Open to all ages. Money Matters Series: Dollars + Sense = ??? The money decisions we make often are not logical or in our own best interest. Join us for a look at the psychology behind our money behaviors and get a glimpse into the weird world of our relationship to money, spending, and the social/emotional side of our finances. Try a variety of different kinds of art in this family friendly art program. We will create tiny pieces of art and the only limit is your imagination. Put your culinary creativity to the test at this Chopped Cooking Competition! Use random assortment of ingredients to create two tasty dishes which will be judged on taste, appearance and originality.